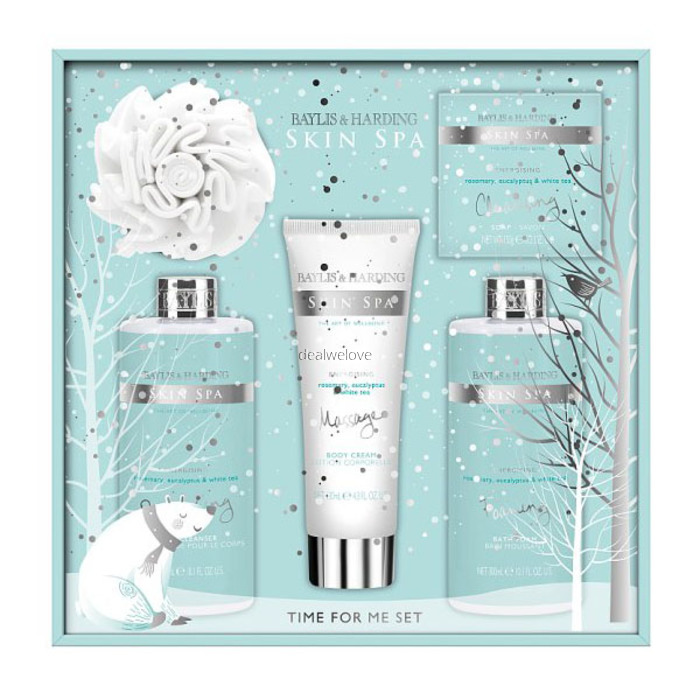 Baylis & Harding's Skin Spa Time For Me Set is a gorgeous gift box presenting five of Baylis & Harding's most popular pampering products. The luxury 300ml Body Cleanser, 150g Soap and 300ml Bath Foam leave skin feeling gently cleansed. The indulgent 130ml Body Cream with Vitamins A, B and C for long lasting softness, whilst the EVA Body Polisher helps the products last longer and gives an exfoliating boost to bath time. Infused with Skin Spa's Rosemary, Eucalyptus & White Tea, a refreshing yet calming scent. Pour into bath under warm running water. BODY POLISHER, BODY CLEANSER, BODY CREAM AND SOAP WARNING: AVOID CONTACT WITH EYES. IF PRODUCT GETS IN THE EYES RINSE IMMEDIATELY WITH CLEAN WARM WATER. IF SKIN IRRITATION OCCURS DISCONTINUE USE. IF IRRITATION PERSISTS CONSULT YOUR DOCTOR. BATH FOAM WARNING: AVOID CONTACT WITH EYES. IF PRODUCT GETS IN THE EYES RINSE IMMEDIATELY WITH CLEAN WARM WATER. EXCESSIVE USE OR PROLONGED EXPOSURE CAN CAUSE IRRITATION TO SKIN AND URINARY TRACT. IF SKIN IRRITATION OCCURS DISCONTINUE USE. IF IRRITATION PERSISTS CONSULT YOUR DOCTOR.